Our Naturalist Guides are knowledgeable, capable and great with kids! 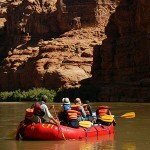 Raft the "Moab Daily" Section of the Colorado River on a private one-day river trip with CFI Naturalist Guides! Our Naturalist Guides really know Professor Valley/Fisher Towers geology, history, river ecology, animal lore, and more. Families are welcome (minimum of 4 years of age). Our guides are particularly great with kids since we work with many youth groups throughout the season. Another reason to choose CFI? 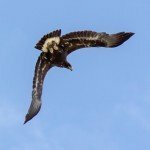 CFI, is a nonprofit, and you help to underwrite quality outdoor education school programs for area students. and there is no additional sales tax added to your fee. This trip will be just for you; we will pick you up at your hotel or meet at CFI headquarters south of town. Your fee includes lunch, snacks, and transportation from town. Deposit: $200/trip deposit (Non refundable; will apply to final total due), With full balance due 30 days prior. 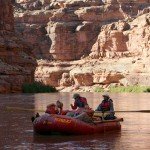 Custom Colorado River Trips - Ruby / Horsethief - Departs Loma, Colorado, and travels through dramatic red sandstone towers. 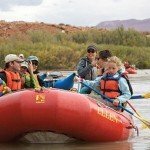 Float the mild waters of Horsethief and Ruby Canyons, OR if your children are 12 years and older extend your trip through the exciting Class III rapids of Westwater Canyon to Cisco, Utah! Camp in tents or under the stars while hearing stories and learning about Colorado River geology, history, and animal life from our naturalist-guides. Special nature art and games are planned for the kids. Our small group size, involvement of all in river camp life, and the enthusiasm, knowledge, and skill of our licensed naturalist-guides assure an unforgettable experience. We have lots of options on dates for this stretch. Custom Lower San Juan River Trips are for adults and kids 6 years old and above. 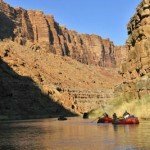 The popular 56-mile stretch is famous for geological wonders and interesting side canyon hikes, mild/moderate rapids and flat water including the world-famous Goosenecks section of the lower San Juan Canyon, a remote wilderness setting. What months available: April through October with spring and fall months ideal. Number of Days/Nights: CFI recommends 5 nights for this stretch which includes first night lodge stay and orientation. Call to discuss typical water levels for the dates of interest. Time: Extend your trip by adding the upper San Juan - call to discuss. 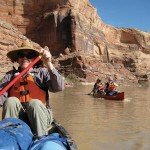 Private Green River Canoe Trips take you for a paddle down the Green River through incredible Labyrinth Canyon. This stretch, which runs from or near Green River to Mineral Bottom, Utah (adjacent to Canyonlands National Park) has been featured in many adventure travel magazines as a must do for both seasoned or beginner paddlers in canyon country. Number of Days/Nights: CFI recommends 6 or 5 night trip with first night motel stay in Green River and trip orientation. Length also depends on water level and interest in side hikes.